How to define and fine-tune brand settings for an accurate brand/non-brand segmentation. How to mark individual keywords as brand. When you register a new campaign in SEOmonitor, you are prompted to input your website's brand name. This step is important because, based on your definition, the app will automatically perform the brand/non-brand segmentation of your organic traffic. In the Brand name field, you should write the words defining your brand, along with some of their common variations and even the "main" misspellings, all separated by commas. 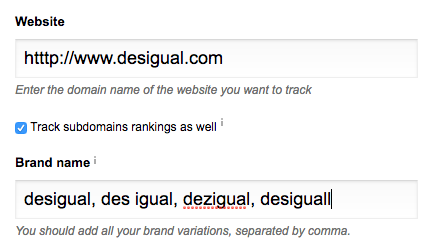 For example, in a campaign for desigual.com, we set words like desigual, des igual, dezigual, desiguall, etc. You can type in up to 20 brand variations. All of the keywords containing those terms will consequently be labeled as brand keywords and any organic traffic these long-tails bring will be considered brand traffic. If you want to modify your main brand words after the campaign is created, you can always do so in the Website Settings section. Once you change the brand rule in the Website Settings section, the split between Brand / Non-Brand data in Organic Traffic module, will be updated retrospectively as well (not just from that point onward).